The nOrh Loudspeaker Co. of Thailand, renowned for its unusual and excellent line of inverted horn speakers, also markets high quality electronic audio gear. The audio equipment is sometimes co-designed with another company, sometimes built to nOrh specifications, and sometimes simply rebadged and brought to the world market under nOrh's name. 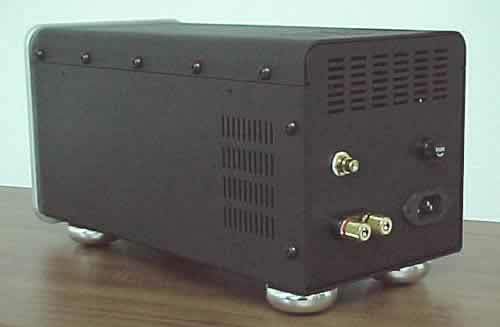 nOrh previously marketed a power amplifier called the Multiamp, a unique design that combined flexibility of use with high quality sound output. While the Multiamp was reasonably priced and had several unique and useful features, it is currently unavailable. 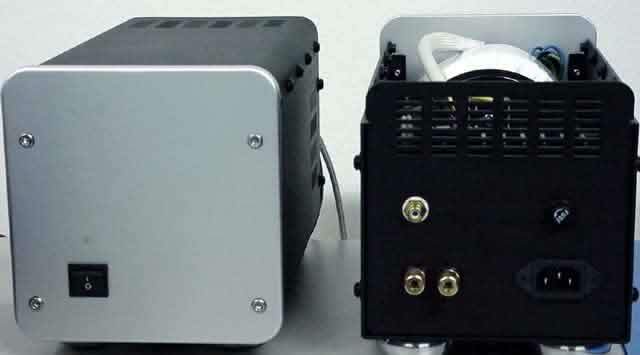 Perceiving a need for an inexpensive, but high quality amplifier, nOrh (along with Integrity Research and Development Company, Ltd (IRD), the cooperative manufacturing firm) has introduced the nOrh Le Amp, a 100-watt monobloc, solid state amplifier. With current pricing, nOrh has provided the means for an audio enthusiast on a budget to have a pair of monobloc amplifiers for a mere $495, or the home theater enthusiast to have five Le Amps (for five-channel surround sound) for $1,240. Home theater will never be the same - and considering the poor audio quality of most home theater components, this improvement is quite welcome. What is the nOrh Le Amp? The nOrh Le Amp, designed by Curt Wishman and built by IRD, is a solid state, monobloc, power amplifier based on the TDA7294 IC chip. Since heat is the enemy of transistors and integrated circuits, Le Amp has been built with a massive, custom-designed, internal heatsink that very effectively cools Le Amp without a potentially noisy fan. This unique heat sink will allow the IC chip to run cool, improving its specifications, preserving its lifespan and providing a stable environment for precise audio reproduction. 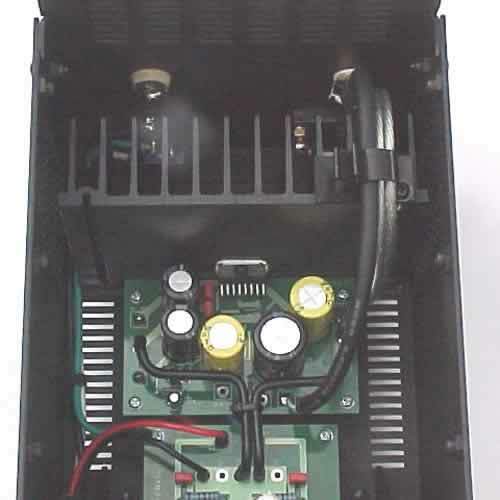 In addition, Le Amp uses a 400 V/A power transformer with a 35-amp bridge rectifier and 20,000µF of reservoir capacitors. Translated: this power supply is capable of allowing tremendous headroom, which should prevent compression of dynamic range under most playback situations. In addition, a silicon-steel shielded, toroidal transformer was incorporated to keep Le Amp exceptionally quiet. Le Amp is rated at a minimum of 100 watts into 8 or 4 ohm loads (based on IEC268.3 rules), and it supports power peaks of 160 watts into 8 ohms, or 240 watts into 4 ohms. This class A/B amp is rated at 0.010% total harmonic distortion (THD) at 72 watts continuous power into 8 ohms, or 0.014% THD at 105 watts into 4 ohms. It is available for 110-120 VAC 50/60Hz, or 220/240 VAC 50/60Hz. Le Amp is not very large: it measures 16.5cm wide x 17.8cm high x 32.5cm deep (6.5 inches x 7.0 inches x 12.8 inches). Despite its modest size it weighs 10.4kg (23 pounds). The amplifier case is constructed more like a vault than an audio amplifier: the sides and top of the enclosure are made from 2mm steel; the front is made from 8mm brushed aluminum plate. Where three black nickel finished screws per side would have been sufficient to secure the removable top, Le Amp uses five per side. Competitively-priced amplifiers usually use simple, glued-on rubber feet; Le Amp uses turned aluminum feet with butyl rubber inserts. 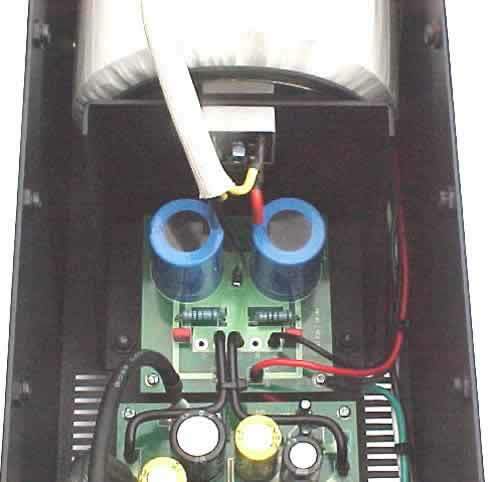 The front panel, which is secured to the main chassis by four stainless steel screws, contains a single rocker-type, power switch next to a bright, green LED. On the back, a single, gold-plated RCA input jack, a pair of gold-plated three-way output jacks, a 5-amp fuse, and a removeable 3-prong power plug complete the package. An unobtrusive white, laser-etched "nOrh" logo is located on the upper portion of the front panel, and a similar "Le Amp" label is located near the bottom of the front panel. The nOrh Le Amp monobloc amplifiers immediately command attention when the volume is elevated. They are powerful, but not overbearing. While they can be played very loudly, they are neither harsh nor excessively forward and can be played comfortably at relatively high volume. At high volume, a pair of Le Amps can be felt as well as heard: the listener can become physically immersed in the music as the bass shakes the walls, yet the sound is clean enough that elevated volume levels (within reason!) are not painful. Le Amps are wonderfully quiet with no noticeable hum or any other unwanted noise between music tracks. While Le Amps sound excellent at high volume, they do not have to be played loudly to be enjoyed. The rated frequency response of Le Amp, from 8Hz to 200,000Hz, reaches well outside the range of human hearing. Within the range of normal hearing, Le Amp provides very good tonal balance. There does not seem to be any unnatural accentuation of bass, and treble sounds quite natural in proportion to the rest of the frequency range. When listening to a pair of Le Amps, the first sonic quality that commands the listener's attention is bass. The bass is strong, quick, lively, and very well-controlled. Bass control of this quality is typical of high-end, solid state amplifiers. However, unlike most mass-market receivers and some amplifiers in the same price class, the bass does not seem unnaturally boosted. The bass level, timing, and rhythm of the recording are faithfully reproduced by Le Amp. Regardless of the complexity or intensity of bass in the recording, Le Amp has no problem driving speakers to reproduce it accurately. This includes bass transients as well as deep bass notes, such as a 30Hz pipe organ. Mid-frequency sound is also reproduced with excellent timing and pacing. Mid- and high-frequency sounds are reproduced accurately, cleanly, and clearly. Le Amps reproduce sound without any noticeable aural artifacts or harshness. Many solid state amplifiers in the price range of Le Amp sound distinctly harsh, with overly bright and sibilant highs, overbearingly forward mids, and bloated bass. Le Amp demonstrates none of these. The result is an amplifier that is non-fatiquing: a Le Amp system can be listened to for hours without the need for an "ear break". There are some people who may prefer the manner in which a vacuum tube amplifier reproduces mid- and high-frequencies compared to Le Amp, but Le Amp's ability to reproduce and control all aspects of the bass range is not a matter of opinion - it is far beyond the capabilities of most tube-amplifiers, regardless of cost. A pair of Le Amps provides a very good soundstage, wide and reasonably deep. A pair of these amplifiers is also capable of 3D, holographic imaging, with the right recording and a suitable source. For example, while I was listening to an LP of Arco Iris, it was possible to locate accurately all the percussion instruments in three-dimensional space. While a pair of Le Amps is not as good at imaging as many more expensive amplifiers, there are very few solid state amplifiers in Le Amp's price range that can equal, much less exceed the 3D imaging of Le Amp. Certain similarly-priced vacuum tube amplifiers, such as a Decware Zen amp, are noticeably superior in regards to stereo imaging, but there is a serious tradeoff for this quality in the Zen - the Zen Amp only has 1.8 watts per channel and requires suitably efficient loudspeakers. Of course, a capability like "holographic imaging" is a fun enhancement to the listening experience, but it is not particularly important to the quality of musical reproduction. The ability of the amplifier to play music cleanly and accurately at volume high enough to feel as well as hear, regardless of the complexity or intensity of the recorded signal, has great impact on many listeners' appreciation and enjoyment. To this end, Le Amp excels. This ability is, no doubt, largely due to the very high quality power supply in Le Amp. A 400V/A transformer in a 100-watt amplifier should give sufficient headroom to provide tremendous dynamic range, and Le Amp has it. Regardless of music played, there was never a hint of dynamic compression. There is also no penalty for playing musically complex recordings at high volume; Le Amp simply delivers. At high volume, Le Amp reproduces all aspects of music, even the most subtle. Le Amp has the quality output, power, dynamic range, and great headroom to allow orchestrated classical music to breathe: a diminuendo can be rendered as clearly and audibly as a crescendo, without any apparent dynamic compression. Le Amp also works very well with all types of rock music. The pounding rythms and blaring guitars sometimes seem to have the impact of solid objects when driven by the kind of clean, easy power Le Amps produce. Le Amps excel where great dynamic range is required. Build quality of Le Amp is extraordinary, particularly within its price range. The case is massively built and very strong. Le Amp has another, very positive aspect to it. Many power amps seem able to fry eggs on their outer surface, Le Amp is a revelation: it is so cool when running at normal volumes that it is difficult to tell it is "on" simply by touching it. Even when pushed hard, it becomes only barely warm to the touch. With the huge, internal heatsink and excellent ventilation, Le Amp is able to stay exceptionally cool without resorting to noisy, potentially unreliable fans. The quality of Le Amp, combined with its extraordinary price leave little room for "negative impressions". However, after obtaining a set of Le Amps, adequate break-in time must be allotted to find out the true worth of these amplifiers. This is true of all audio equipment that hasn't been broken-in prior to acquisition by the consumer. The pair of Le Amps used for this evaluation sounded substantially better after about 100 hours of break-in time. The nOrh Le Amps tested for this evaluation had a slightly brittle sound to the high end, not enough to be considered harsh or irritating, but just enough to intrude during playback with some types of music. It should be noted that this brittleness was only really apparent when making direct comparisons between Le Amp and a pair of single-ended triode (tube) monoblocs that cost substantially more than Le Amp. Musical detail of this pair of Le Amps was very good, allowing the listener to hear and appreciate nearly everything on the recording. However, while detail was very good, there was still a bit of veiling over the music - during some very familiar passages it seemed as though there was a cloth over the speakers obscuring very fine details of the music. To be fair, this effect was again only apparent when comparing Le Amp to a much more expensive pair of SET monoblocs. When comparing Le Amp to a competitively-priced, SET stereo amplifier, the K2003 made by Antique Sound USA, there was very little difference in musical detail. However, it must be noted that, while differences in musical detail weren't significant between Le Amp and the K2003, there was a huge difference in Le Amp's ability to deliver quality bass and dynamic range - the little ASUSA amp wasn't in the same class and simply could not compete. One final note under Negative Impressions: the green "Power On" LED on the front of the tested Le Amp was so bright it seemed no other lights were needed in the darkened room when a pair of Le Amps was on. They even cast substantial shadows. Thankfully, nOrh has changed the specification, and all Le Amps now will be shipped with dimmer power LEDs. 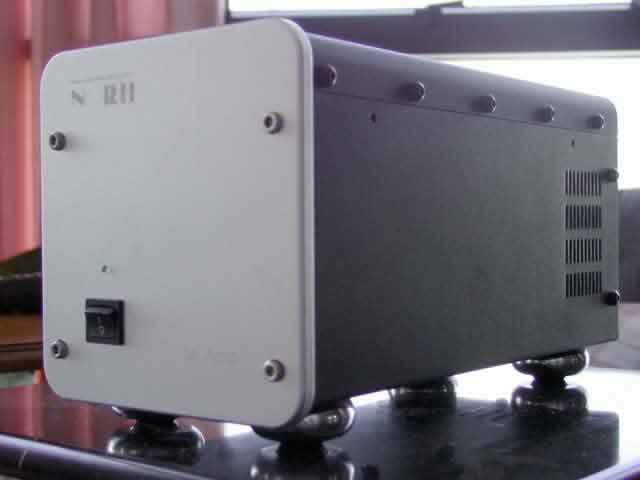 Michael Barnes of nOrh and Curt Wishman of IRD have perceived the need for an inexpensive, yet high quality amplifier. Like a few other companies in today's market, they are now filling a void left by the demise of companies like Heathkit, Scott, and Dynaco who provided excellent quality products at bargain prices. Once again, audiophile-quality equipment is available that is priced near or slightly higher than the poor-quality, mass-market audio equipment that dominates the consumer audio market. Le Amp is a powerful, monobloc amplifier with excellent sound output quality. While rated at a minimum of 100 watts, peaks can be substantially higher without any strain on the amplifier. The power supply of Le Amp allows it to do what most, very expensive amplifiers easily accomplish and what competitively-priced amplfiers usually can't: that is, to provide sufficient headroom for any kind of music. Along with this huge power reservoir, Le Amp provides quality of sound that is hard to match for less than three or four times the price of a stereo pair of Le Amps. When comparing Le Amp to similarly-priced amplifiers, such as the Creek A43, Le Amp is clearly superior in terms of both rated power and the headroom provided by its huge power supply. Le Amp also has cleaner, stronger, and better controlled bass. While the Creek provides very good mid- and high-frequency performance, it is matched, if not bettered by Le Amp in this regard. In addition, the A43 costs about $150 more than a stereo pair of Le Amps. When comparing Le Amp to similarly-priced tube amplifiers, some have slightly smoother treble, somewhat better detail, and slightly better holographic imaging, but none of them can even approach the dynamic range or quality of bass output of Le Amp. The nOrh Le Amp is the best built amplifier for under $2000 that I have seen recently. It is solid, built to last, and is quite attractive in its elegant simplicity. At $495 for a stereo pair, Le Amp is hard to resist, and harder to beat. For the audiophile who doesn't have money to burn, this is an excellent opportunity to obtain monobloc amplifiers that will perform as though they cost several times more than they did. In fact, it would be wise for everyone who wants excellent sound quality delivered with copious power to buy several Le Amps quickly, before nOrh comes to its senses and starts charging what these things are really worth. Most mass market, home theater sound systems (HT) are powered by pitiful receivers that have dismal sound quality, little power, and no headroom. The step from the grim reality of affordable HT to extraordinary HT systems is built upon large sums of money; seldom are good quality and low price found together in HT. Enter - nOrh. In addition to two-channel audio, Le Amp also is being marketed as a solution for multichannel home theater. The power and quality of Le Amp is unmatched by anything in the home theater market, at least within a price range that is affordable by average people. Additionally, the demands of Home Theater are slightly different than audio; power is even more important since viewers of videos generally demand that sound effects and musical scores move them with visceral impact. This requirement seems well-suited for Le Amp with its easy power and generous headroom. In addition, monobloc amplifiers seem to be the best solution here, allowing an HT enthusiast to simply add amplifiers as channels are added. At the price of Le Amp, there are precious few monobloc amplifiers available, and fewer still that can compete with its quality and power. However, if the vision of home theater with reasonably-priced, high-fidelity sound is to be realized, there is still a void left to fill. Affordable, superior quality, stereo preamplifiers are easy to find. These range from solid state offerings by nOrh (the Audio Control Amplifier, or ACA), Creek, and many others, to vacuum tube units by Bottlehead, ASUSA, and countless small manufacturers. At this time, however, the selection of affordably-priced, surround sound decoders and multichannel preamps that are worthy of Le Amp is very poor. Le Amps were originally offered by nOrh with a DC-blocking capacitor in place to protect customers' speakers from DC offset common in non-audiophile grade audio/video gear, including equipment often used by DJs. The Le Amps in this evaluation were tested both as DC-blocked, and DC-coupled. Bear in mind, the DC-blocking capacitor serves a very useful function, that of protecting tweeters from damage due to DC offset from less-than-excellent audio gear. However, when the DC blocking capacitor was in place within the circuit, a significant amount of detail was lost, smeared, or simply veiled. As a result, the soundstage seemed much smaller and flatter and holographic imaging was poor. A pair of Le Amps still provided great power, dynamic range, and wonderfully strong and controlled bass, but mids and highs suffered noticeable loss of quality. All Le Amps are now shipped DC-coupled. If a customer has a need for speaker protection, Le Amp can be converted to DC-blocking. Thank you very much for your review. I believe the review is a very accurate description and I am sure that many readers will benefit from your detailed description of Le Amp. The article correctly identifies IRD and nOrh's goal. Our goal is to give the audiophile who can not afford the most expensive amplifiers something that they will be happy with and will last for many years. In the audio world, there is a term called "the point of diminishing returns". This is the point where it costs more and more money to make the smallest improvement in sound. Our goal has been to shift this point of diminishing returns so that it becomes more affordable and if possible, and at the same time, raise the bar. Thank you very much for letting the audio world know about Le Amp. We believe this is a great service to your readers. Photographs used in this review courtesy of nOrh Loudspeaker Co., Ltd. Many thanks to Michael Barnes, president of nOrh,and everyone else involved for providing the units used for this review.